Jilin University (JLU) is located in Changchun, the capital city of Jilin Province in China .Founded in 1946; it is one of the key extensive research universities directly under the Ministry of Education. JLU is the largest university in China and is ranked among the top 10 key universities in China. 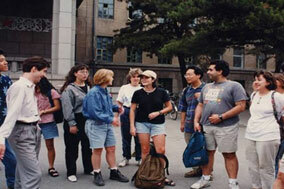 Jilin University is distinguished by innovative research and scholarship across the widest coverage of disciplines. It has now the highest enrollment and is an important national training base for nurturing professionals and elites in philosophy, economics, law, literature, education, history, science, engineering, agriculture, medicine, management, and military science. Not only can undergraduates enjoy an excellent learning environment, but also graduate students benefit from opportunities of working in national laboratories and doing research in national projects, under the guidance of learning scientists, eminent professors and academicians. Many world-renowned experts conduct joint research with our faculty members; overseas students from all over the world come to Jilin University. On our campus appears a fresh wind of intellectual and academic liberty, with different cultures intertwined and interacted with each other, which predicts a bright and prosperous future. Welcome international students come to study in JLU. Norman Bethune america.html of Medicine of Jilin University with a history of more than 70 years was named after the outstanding Canadian surgeon to pay tribute to him because of his selfless devotion to the Chinese people. The medical america.html was founded by Norman Bethune in September 1939 in Tang county of Hebei Province in China. Since more than half a century, the institution has trained over thirty thousand medical professionals and contributed a lot in the development of medical science, medical education and public health in China and has being played an essential role in the development of medical field of China. After the merger with Jilin University, more emphasis has been laid on the development of medical education. Norman Bethune america.html of Medicine provides a wide range of programs. Full-time undergraduate programs include Clinical Medicine (of five years, six years, seven years and eight years), Dental Medicine, Chinese Medicine, Rehabilitation Medicine, etc. In undergraduate programs, there are 2000 Chinese students, 237 international students studying MBBS program in English and about 100 international students studying in various programs in Chinese. Besides the undergraduate programs, the america.html offers 2 post-doctoral programs (Basic Medicine and Clinical Medicine), 2 first-level doctoral programs, 24 second-level doctoral programs, 45 master's degree programs, which cover all the specialties. All the doctoral programs and master's degree programs covering all the clinical medicine specialties are available for international students who want to work on master’s or doctoral degree in Norman Bethune america.html of Medicine. Now the america.html has 4552 faculty and staff members in which there are 82 doctoral and 377 master's degree advisors. Moreover, Norman Bethune america.html of Medicine is active in international cooperation and exchange programs, and has established partnerships with 26 educational institutions and academic organizations in many countries and districts such as Japan, Canada, USA, Great Britain, Sweden and Hong Kong. Life for International students is pleasant. Dormitory rooms are well furnished. Each year, the University hosts many academic and cultural events including seminars, forums, speech competitions and, performances on various topics and subjects. Many student groups and organizations enrich campus life with colorful activities. The First Clinical Medical Hospital was established in 1949 as a comprehensive teaching hospital; integrating medical treatment and teaching research. It is one of the best hospital in Jilin Province and among one hundred best hospitals of China (The First Class Hospital in China.). The hospital has an area of 72,650 square meters and faculty and staff of 1855, including 113 professors, 294 associate professors and 232 advisors. There are 1,100 open beds in central hospital and 350 open beds in the subsidiary hospital. The number of patients visiting OPD is over 1,520,000 in 2009. The institute offers 16 master's degree programs, six doctoral programs in neuromedicine, neurosurgery, otolaryngological& neck surgery, orthopedics, general surgery and digestive medicine. There are 45 doctoral advisors, offering doctoral and post-doctoral programs. The institute also offers pediatrics doctoral program in cooperation with Peking University. Key disciplines include neuropathy (under Ministry of Education), internal medicine, surgery, obstetrics and gynecology, pediatrics, infectious diseases, neuromedicine, neurosurgery, ophthalmology, otolaryngological& neck surgery and orthopedics (under Ministry of Health). 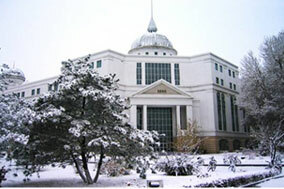 Research institutes include National Training Center of Neuromedicine, TumorCenter (jointly run by Norman Bethune america.html of Medicine and Lavern University, Canada), Jilin Province Consultation Center for Difficult and Complicated Diseases, Jilin Province Institute of Cardiovascular Study, Jilin Province Liver Disease Institute, Jilin Province Geriatrics Institute, Jilin Province Pediatrics Institute, Jilin Province Otolaryngological and Neck Surgery Institute, Jilin Province Institute of Male Urological Disease, Jilin Province Blood Disease Institute, Jilin Province Institute of Endoscope Surgery, Jilin Province Institute of Trauma Orthopedics, and Clinical Pharmacology Base. The institute is also in charge of editorial works of "Apoplexy & Nerve Disease" Magazine and "Clinical Liver and Gall Diseases" Magazine. Address: No. 71, Xinmin Street, Changchun City, Jilin Province, China. Since last ten years, the institute has undertaken 171 national and Jilin Provincial key research projects, and won 35 national, ministerial and provincial prizes of scientific and technological advancement. The institute is leading internationally and domestically in the following fields: neuropathology, hearing reconstruction of various conductive deafness, ear neurosurgery, joint biological reconstruction in the first phase of bone tumor and research of bone biology, 3-D encephalic imaging technology, kidney transplantation, bone marrow transplantation, free skin pedicle transplantation, remaking fingers by foot and finger transplantation, wrist trauma reparation and function reconstruction, examination of density of medicine in blood, treatment research of portal maximum pressure, treating arrhythmia by RFA, Percutaneous Balloon Mitral Valvuloplasty (PBMV), bifocal advanced back-atrium artificial crystal implantation and application of peritoneoscope, etc. The Second Clinical Hospital was founded in 1948 as a comprehensive teaching hospital, with an area of 4,136 square meters in the center of Changchun City, the capital of Jilin Province in China. Research Institutes and Centers under the hospital are Jilin Province Respiratory Disease Institute, Jilin Province Center for Ophthalmology Prevention and Treatment, Jilin Province Research Center for Perinatology Medicine, Northeast Training Center for Breast-Feeding, Jilin Province Institute of Dermatosis& Venereal Disease Prevention and Treatment, Jilin Province Center for Digestive Endoscope Diagnosis and Treatment, Tumor Prevention and Treatment Center, and Hospital for Supporting and Helping the Poor and the People in Need. The Institute is the Clinical Pharmacology Base of the Ministry of Health and the network hospital of the International Urgent Rescue Center of the Ministry of Health with 27 clinical departments, 12 medical technological departments, 15 teaching and research sections and 1000 beds. The hospital possesses more than 300 sets (pieces) of large-scale devices and equipments such as nuclear magnetic resonator, digital silhouetter, spiral CT machine, ophthalmologic quasi-molecular laser pickled light series correcting machine, nationally leading NT series endoscope imaging display, color Doppler, ophthalmologic Ar/Kr laser and YAG laser machine, fully-automatic biochemistry analyzer, linear accelerator and Co 60 radiotherapy machine, etc. Among the 1248 faculty and staff members, there are 40 professors, 90 associate professors and 384 nurses of different levels. The hospital offers 16 master's degree programs, 6 doctoral programs with 17 doctoral advisors. Every year about 500,000 patients visit OPD of the hospital and the number of patients discharged from hospital is about 14,000. Since 2000, the institute has won 84 prizes from the Ministry of Education, the Ministry of Health, Jilin Province and Changchun City, and published 1402 academic papers. 95 new technologies and therapies have been developed since 2000 by the hospital. The hospital has become the first national comprehensive infant-loving hospital in Jilin Province since September 1993. It has been ranked as the First Class Hospitals in China since 1990s.. Address: No.218, Ziqiang Street, Changchun City, Jilin Province, China. The Third Clinical Hospital (Sino-Japanese Friendship Hospital) was founded in 1949 as the Surgical School of the China PLA Changchun Medical University. In 1957, the department of general surgery announced the first successful maximum excision of liver ever made in China. In 1963, the success of cardiac surgery employing extracorporeal circulation and intracardiac direct-vision filled the blank of Jilin Province in this field. In 1964, the Institute was again successful in the severed arm replanting operation. Since 1962, the otolaryngological and neck surgery department has successfully completed 150 butterfly saddle tumor operations through nostril. In 1978, the urological surgery department succeeded in a kidney transplant operation being the first in Jilin Province; it has now a record-high of 970 successful allogenic kidney transplantation. Since 1982, the hospital has reported two liver transplants in situ and more than 1000 allogenic cornea transplants; the non-operational melting therapy of the cardiovascular medicine treating fat obstruction myocardial disease with dehydrated alcohol has reached the world advanced level. The institute was officially approved by Jilin Province in 1993 as Level 3, class A hospital. The Ministry of Health allocated funds and expanded the Hospital in 1993, increasing its space to 227,800 square meters. The total fixed assets amount to 210 million Yuan and there are more than 750 sets (pieces) of advanced medical appliances. The Japanese government granted 2.6 billion yen of equipments. The hospital has 952 beds. There are 14 teaching and research groups; 43 clinical, medical and technological sections. The institute has two key disciplines of the Ministry of Health (otolaryngological and neck surgery, and orthopedics). Research institutes include the Jilin Province Surgical Institute, Jilin Province Cardiovascular Institute, Jilin Province Orthopedics Trauma Institute, Jilin Province Radioactive Interposition Institute, Otolaryngological and Neck Surgical Institute and Hand Surgical Center. There are 1,449 faculty and staff members, including 54 professors, 94 associate professors, 197 instructors, with 16 doctoral professors, 88 master's degree program advisors, offering 4 doctoral programs and 24 master's degree programs. Through all the years of development the hospital is well-known for cardiovascular diseases diagnosis and treatment, trauma treatment and tissue organ transplantation. Address: No.126, Xiantai Street, Changchun City, Jilin Province, China. MBBS (Bachelor of Medicine and Bachelor of Surgery) program in Norman Bethune america.html of Medicine, which began in June 2005, is a program provided for international undergraduates. All the courses in the program are taught in English. And it usually has 6 or 7 academic years. The whole process of education of the international students is carried out according to The Quality Standards and Regulations for Medical Education of International Undergraduates taught in English promulgated by Ministry of Education of People’s Republic of China. Until now, there are altogether 200 international students enrolled in this program, most of whom come from India, Nepal and other South Asian countries. The international students study the following courses such as Physiology, Histology & Embryology, Human Anatomy, Microbiology, Immunology, Biochemistry & molecular biology, Pathology, Pharmacology, Diagnosis, Internal Medicine, Surgery, and so on. The Office of International Students and Foreign Affairs in Norman Bethune america.html of Medicine is responsible for the recruitment and management of international students, the management of teaching activities, and so on. Outstanding Faculty: after a careful selection, about a prominent teaching facuty with the number of five hundred take part in MBBS program, most of whom have the experience of studying or working abroad including many famous professors hired aboard. ULMLE Training Program: the america.html has invited some professors who are also clinicians working in USA to give lectures to international students on USMLE (United States Medical Licensing Examination). These series of training programs aim at helping international students to pass USMLE. Early Participation in Medical Scientific Research Programs: Norman Bethune america.html of Medicine supplies about 30 medical scientific research programs for international students to participate in. Till today, more than 50 outstanding international students have taken part in those programs. Internships: The internship for MBBS program students is 1 year (at least 48 weeks) with tuition fee of RMB 29,000 per year. Students can choose to do it in China, their home country or any other country. Apart from the three main teaching hospitals, there are more than 30 cooperative hospitals that provide internship resources for medical students of Norman Bethune america.html of Medicine. Tutors for International Students: Tutors are provided in Norman Bethune america.html of Medicine to help international students adapt to new environment; they also give them advice and guidance on their studies. Norman Bethune america.html of Medicine, Jilin University offers postgraduates programs taught in English for international students, which is outstanding in medical education home and abroad. All the master’s and doctoral programs covering all the basic clinical medicine specialties are available for international students who want to work on master’s or doctoral degree here, the students could be taught both in English and Chinese. We warmly welcome high-level international students to study for their master’s or doctoral degrees in Norman Bethune america.html of Medicine, Jilin University in China. Self-financed students apply directly to the Office for International Students and Foreign affairs of Norman Bethune america.html of Medicine, Jilin University. The students who want to apply for the Chinese Government Scholarship should send their application to the relevant organizations of their government or to the Chinese Embassy in their country. Degree seeking students (bachelor’s, master’s, doctoral) must mail their application to the Office for International Students of Norman Bethune america.html of Medicine before August 31st, and New Semesters begin or August 31st to September 13. Doctoral program student: must have a master’s degree; age not over 50. Master’s or doctoral degree program applicants should submit 2 recommendation letters written by persons with the titles higher than associate professor. Applicants, who do not have any HSK and apply for the programs taught in Chinese, must study Chinese for a year before they start their specialties. The Office for International Students of Norman Bethune america.html of Medicine, Jilin University will examine the application materials provided by students. If the students are qualified to be enrolled, Jilin University International Student Admission Notice and the Visa Application From for Foreigners to Visit China (the JW202 Form) will be sent to the applicants. The applicants should bring all the required documents to the Embassy/Consulate of the People’s Republic of China in the applicants’ home country and apply for an X or F visa to study in China. Dormitory rooms are equipped with TV, Telephone, and Bathroom. Any students who wants to live off-campus is demanded by regulation to report to the local police substation and fill the Foreigner Resident Registration Form with 24 Hours after moving into the house rented. ④ Applicants who do not has any HSK certificate and apply for programs taught in Chinese, must study Chinese for a year before they start their specialties. Changchun City is situated at the heart of Song Liao Plain in North-Eastern China, which is broad, mainly composed of plain. It is so beautiful and attractive that more and more friends from all over the world has come here. Welcome you to come to study in Changchun. History:Changchun is a young city with only about 200 years of history. In the year of 1800, Emperor Jiaqing of Qing Dynasty selected a small village on the east bank of the Yitong River and named it as "Changchun Ting", and in the year of 1889, it extended to be "Changchun Fu". In 1930, the Japanese invaded the Northeast China, established the Manchurian Public country, and singled out Changchun as its capital. After liberation, Changchun became the capital of Jilin Province, and a city of education with dozens of universities, institutes and schools built in. Changchun is also famous for automobile and film industry. Both Changchun Automobile Industry and Changchun Film Studio are located in the city. Climate:Normally, the annual average temperature of Changchun is about 7.0 ℃, annual rainfall is about 517.2 mm, annual average relative humidity is about 57 per cent, and annual sunshine time is about 2,500 hours (based on data offered by China Statistics Year Book). Take those data of 2003 as example, January was the coldest month of the whole year with a monthly average temperature of -13.7 ℃, while July is the warmest month with a monthly average temperature of 22.8 ℃. City Infrastructure:Changchun Airport lies in the west of the city, offering domestic flights to other China cities including Beijing, Dalian, Guangzhou, Shanghai, Shenzhen, Hong Kong etc, and international flights to, Korea, Russia, etc. Changchun Railway Station lies at the north end of Ren Ming Street, at the downtown of Changchun City. By train, you can directly arrive at a dozen of cities in China. There are several trains take Changchun Railway station as their departure station, while take Beijing, Shanghai, Xi'an etc. as their terminal station. Five highways pass through Changchun: Sheng Ha Highway, Chang Ji Highway, Chang Yin Highway, National Highway 102 and National Highway 302, connecting Changchun directly with Shengyan, Jilin city, Harbin, Beijing, etc. At the end of 2002, the whole city has a gardening green area of 5,732.3 hectares, a public green area of 1,667.2 hectares, and a constructed virescent area of 6,575.4 hectares. The virescent area covers 39% of the whole city. Main Attractions:In 1950, when Changchun Film Studio was built, it became the first film factory in P. R. C. However, it has lost most of its market to Hollywood Film Factory and Hong Kong Film Studio nowadays. In order to kick up a bit of money, the Changchun Film Studio opened up its doors to the general public several years ago and built an extension, the Movie Palace. 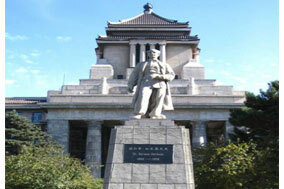 Visitors can get to see props of palaces, castles and scenery. Here visitors may also see the process of film-making and even catch a glimpse of favorite Chinese film stars. Visitors to Changchun can also go to such scenic spots as South Lake Park, the Manchurian Imperial Palace, Film Palace, Jinyue Forest Park and Kalun Lake Scenic Spot, etc. Living Standard:The cost for a living in Changchun is comparatively low. For international students, the monthly cost is between 800 RMB to 1000 RMB ($150-$200). In a word, life for international students in Changchun is very convenient and comfortable and welcome to study in Changchun.